Can you take a guess who this is??? 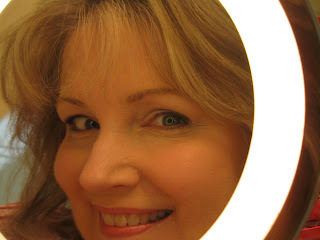 It's me.......my face in my magnified mirror. I am feeling better and this is the first time in a while now that I feel good. I needed to take a picture of myself to see me feeling good!! I wanted to show all of you a recent picture of me as well. I have an older picture of myself on my profile taken about three years ago I think. I look at that picture and while it is me it is no longer who I am now. My faith in God is much stronger now! I have a wonderful connection with you my blogging friends. My Mother is living with us now and I can take care of her now. My husband took me and my Mom to the Doctors yesterday and we are both doing much better. Mom's lungs are clear and my biggest problem is actually allergies!! I told the Dr. what I have been doing for mom during her cold/cough and he said that I did all the right things for her!! Yippee what I relief to hear that!! Thank you God! !